While the odds favor a top being in, I cannot confirm the top until we break below Dow9630/SP1039. 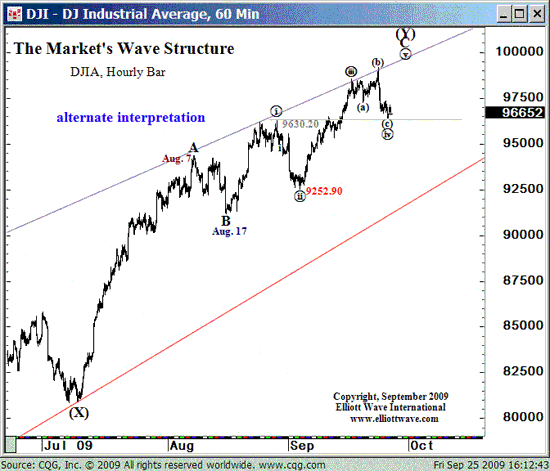 One of the immutable rules of Elliott Wave is that a wave 4 cannot fall into the range of the prior wave 1. This chart from the STU shows the alt wave count for us having one more wave up to complete the rally (or at least complete the wave action since Jul8). We got very close at SP1041 and approached it with Dow9666. We fell off the peak in five waves, which is consistent with the peak being in (five waves indicate change of trend) – but is also consistent with a flat correction in wave iv (a 3-3-5 pattern). 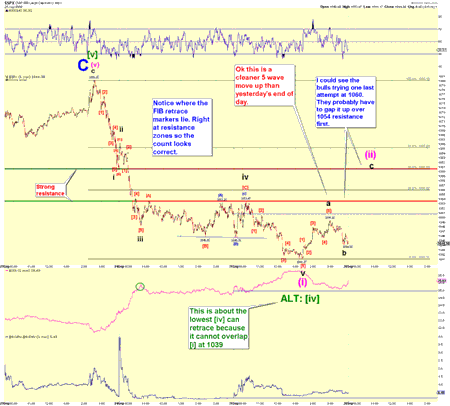 The second chart (courtesy TradersAffiates) shows the five wave fall and the action yesterday. It is breaking in a corrective fashion (looks like another flat). If we were still in wave iv, the action should show the impulsive behavior of wave v. It looks instead like a counter-trend move to the sharp break down – a wave 2 to the wave 1 down.Typical retracement levels would be 38% – 62%. Since the S&P had fallen ~32 pts (1080 to 1048) to that endpoint, the counter-trend should come back 12 – 20 pts, or SP1060-68. Given the corrective look, how can this chart support a future wave v? One way would be if the corrective action shown as waves A and B represent an X wave connecting the completed flat with a new corrective pattern to follow; after that we would complete wave iv and have v to go. if this X and follow-on happen pretty fast (less than a week or so), this could fit. While wave 2’s tend to be sharp, wave 4’s can meander. Yet as the monthly EWFF made clear, the whole rally off Mar6 should NOT be expected to “drag on for months” since the reaction to the sharp drop last year is to be expected to be a fairly fast bounce, as this one has been. Hence such a complex wave iv is unlikely. Let me provide what I think is a better count that avoids these problems. 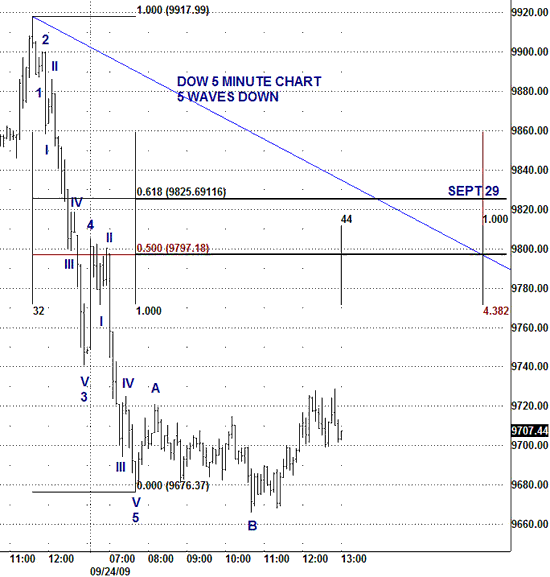 The third chart is courtesy Daneric and shows a count that ends the wave down at the low point, not SP1048 but SP1041. The sharp drop listed as a completed five waves in the second chart is merely the third wave down; waves 4 and 5 completed today at SP1041. The rise from that point can be counted as a five-waver, which is consistent with either a zig-zag counter-trend (a 5-3-5 pattern) or the start of the final wave v up. In this count the wave down was 39 pts (1080 to 1041). Targets for the counter-trend are again 38-62%, or SP1056 – 1065. The 50% point is 1061. 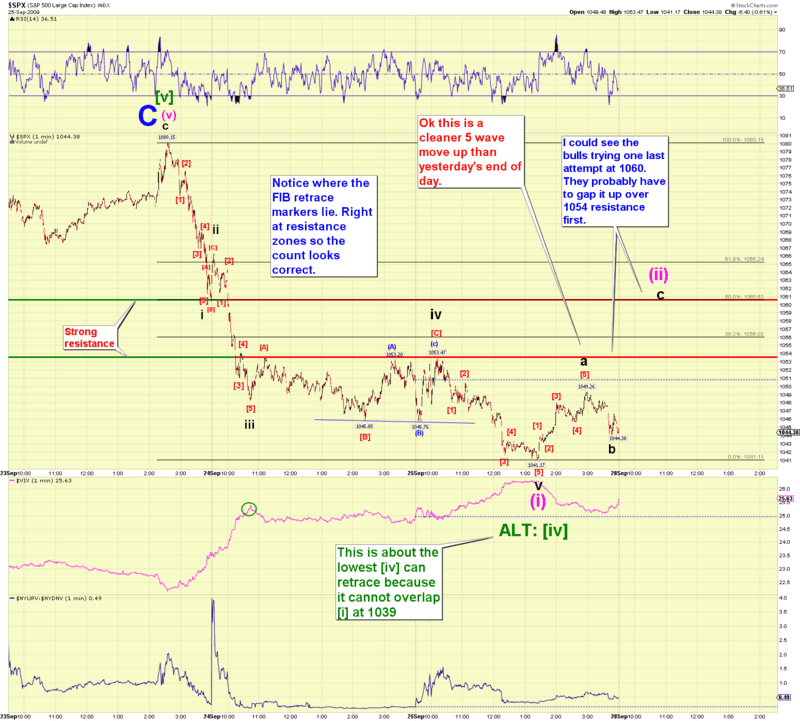 SP1061 is also key pivot point according to Tony Caldero. We get past that and he thinks wave v is on! Daneric speculates that on Monday we will blast past the 1053 resistance level and hit against 1060; then we shall see what happens. A fade may turn into the fall below the critical levels of Dow9630/SP1039. So watch for SP1060 Monday.